Let's talk about library marketing. It is an important part of libraries. It is how we get the word out about our collections, boost attendance to our programs, share with the public the good we do for our communities, and how we bring in new cardholders. But there are so many different ways to advertise, so many different formats to use, and too little hours in the day to get it all done. 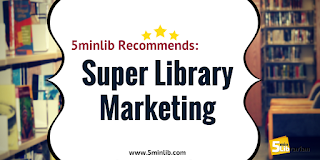 We at 5minlib wish we have the perfect library marketing plan for you, however our expertise is limited. But there's good news! Angela Hursh is a content marketing enthusiast and she shares her wisdom on the fantastic Super Library Marketing blog. As she says in the tagline, it is all kinds of marketing ideas for all kinds of libraries. It is one of our favorite blogs and we're excited to highlight it today. Hursh has a wealth of marketing ideas from different kinds of social media to signage. She breaks them down into easy, doable steps. 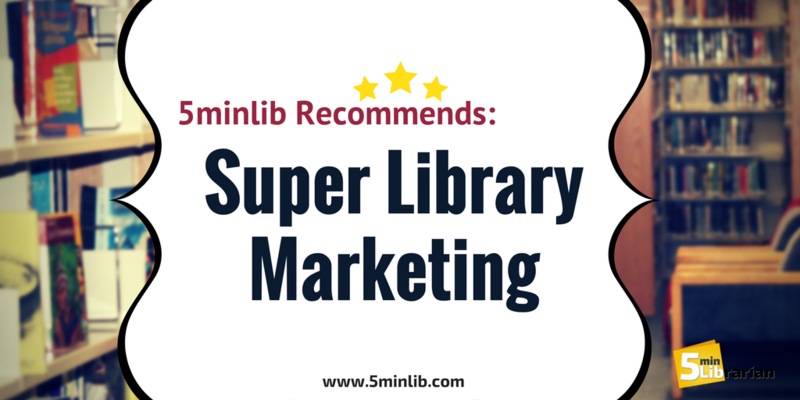 She also explains the pros and cons, the do's and don'ts, and provides examples so you're armed with everything you need to know to really up your library marketing. For example, Hursh is a huge proponent for email marketing. She not only explains why, but gives you tips on how to write good subject lines, content, spam words to avoid, and how to analyze marketing data. Marketing takes up a lot of time, but with Hursh's blog, you can focus your time on the parts that'll really make a great impact. To easily find specific topics (like emails, Youtube, Snapchat, signage, etc. ), use the search feature on the right. When you click on an article and scroll to the end, you'll find tags which lists the keywords for her categories so you can find more on that topic. You can go to the website at www.superlibrarymarketing.com. You can also follow Hursh on Twitter, LinkedIn, Instagram and Pinterest via @webmastergirl.